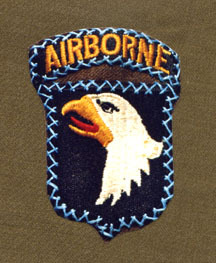 The 101st Airborne's divisional 'Screaming Eagle' shoulder Sleeve Insignia (SSI) is a tribute to 'Old Abe', the eagle mascot of the 8th Wisconsin Infantry Regiment, which fought under General Sherman in Georgia and later in Alabama, in the Civil War. The example at left is U.S. made, and as far as I can determine, was the most widely issued, and therefore the most common variant of WW2. I call it the Type 1. It has a well-balanced design, with a detailed eye and a seperate Airborne tab. 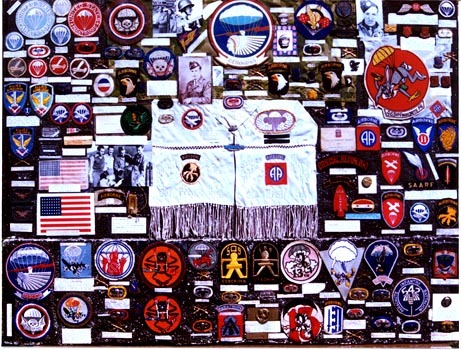 At least 18 different American companies made screaming eagle patches for the U.S. government in WW2, each having it's own unique design, with minor sub-variations. At least 8 distinctly different British-made variants have been identified. Who knows how many more exist? (See the Eagle Patch Corner pages). 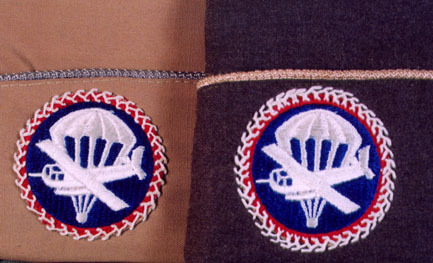 The patch at right is the most common British-made variant, Type B-1, with a wool base and design executed in cotton thread. The tab and shield are also seperate. 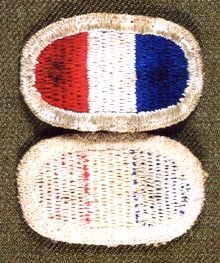 These materials were typical of British made patches, but some were also done with metallic wire thread. As Tom Taylor (son of Maxwell D, and a paratroop officer of the 502 in Vietnam) says, the eagle patch is a 'Talisman'. The symbol of the great American eagle not only imparts great courage, pride and boldness to the wearer, it has also come to strike fear into the hearts of the enemies who meet it on the fields of battle. 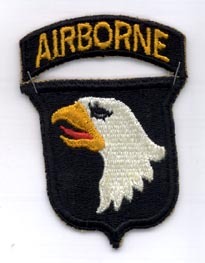 The eagle's head and neck are visible from considerable distances, and this patch is a significant part of the mystique of the 101st Airborne. All organic units of the division wore this patch on the left shoulder through training and combat. Attached units such as the 506th, 501st and 463rd also wore it in combat, and as long as they were serving with the division. 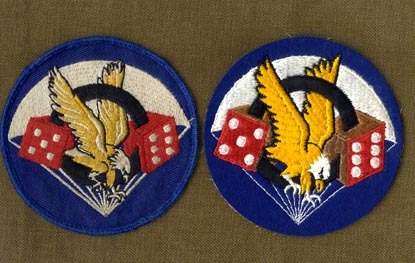 More eagle patch variants are illustrated in the Eagle Patch Corner pages. The GHQ Reserve SSI The GHQ Reserve shoulder sleeve insignia was worn by members of small units, which were not part of a division. As such, the 506th PIR wore this patch, during their basic training at Camp Toccoa, GA. 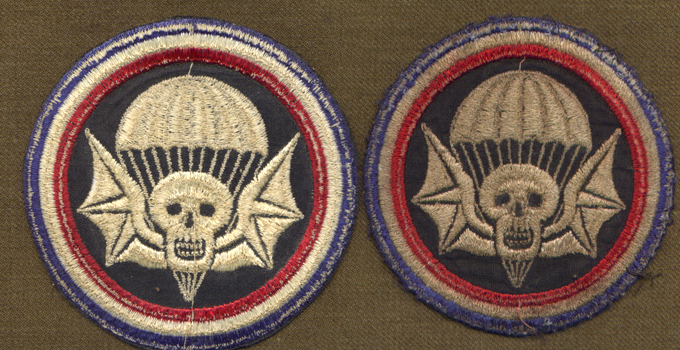 The 501st PIR also wore this patch while at Toccoa and Ft. Benning, for jump training. 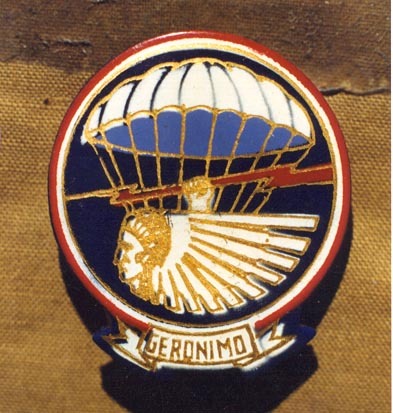 This patch was replaced by the Airborne Command SSI described below, in early 1943. As to the patch itself, it is fully embroidered and can be found in various sizes. The two basic variations are with and without an OD border. There is also a type having a green thread finish on the reverse. These are known to collectors as "green-back patches". Many collectors specialize in greenback patches, because it seems they were only made during WW2. In eagle patches, I've seen Type 1's, Type 6's and Type 7's with the green finish on the reverse-possibly all made by the same patch manufacturer? The Airborne Command SSI Before troopers of the 506th and 501st ever wore the screaming eagle patch on their left shoulder, they wore the Airborne Command patch. 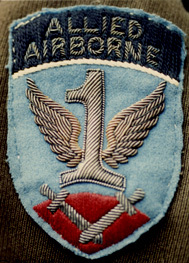 Whereas the GHQ reserve patch was worn at Toccoa, for small units not yet assigned to a division, the Airborne Command patch was created for small, non-divisional Airborne units. As such, the 506th wore this patch for a few months in early 1943, while stationed at Camp Mackall, N.C. This was after they completed jump school, but before they joined the 101st Airborne Division at Ft Bragg, N.C., becoming members by attachment. At that time, the 506th began to wear the eagle patch. 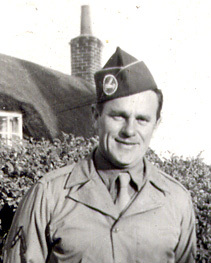 The 501 PIR wore the Airborne Command patch for longer, beginning in spring, 1943, and wearing it until early January, 1944, when they sailed for the UK. The 501st was attached to the 101st ABD in England and only then began to wear the screaming eagle insignia. 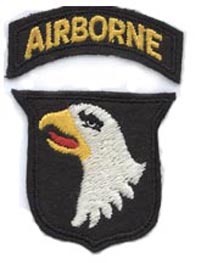 Airborne units stationed stateside, continued to wear this patch into 1945, including the 555PIB, the Parachute Training Regiments in GA and AL, and the 541st and 542nd PIRs in N.C.
Several variants of the Airborne Command patch are illustrated above. The most common type is fully embroidered, with attached tab. Some sub variants of that exist, with longer or wider shields. There is another fully-embroidered version with a seperate tab and shield. Those are smaller in overall size and length. Pictured in the center is a standard type, with blue piping (dyed suspension line) sewn around the outer edge. This modification was worn by some members of the 541st PIR at Mackall, and this specimen comes courtesy of Herman Moulliet, who later joined 1st Bn 506th as a replacement. 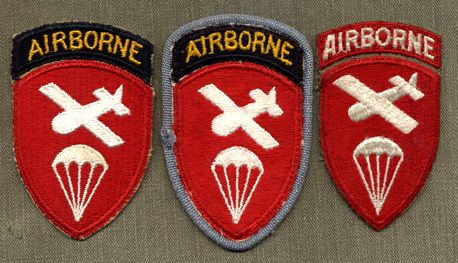 The example at right has an attached red Airborne tab, and is just a manufacturer's variation. A myth has circulated at collectors' shows, stating that this type was unique to the 'Triple Nickel'(African-American 555 Bn), but this is untrue. Although some 555 vets may have them in their effects, my example came from Harry Antoon of the 2/501 LMG platoon. 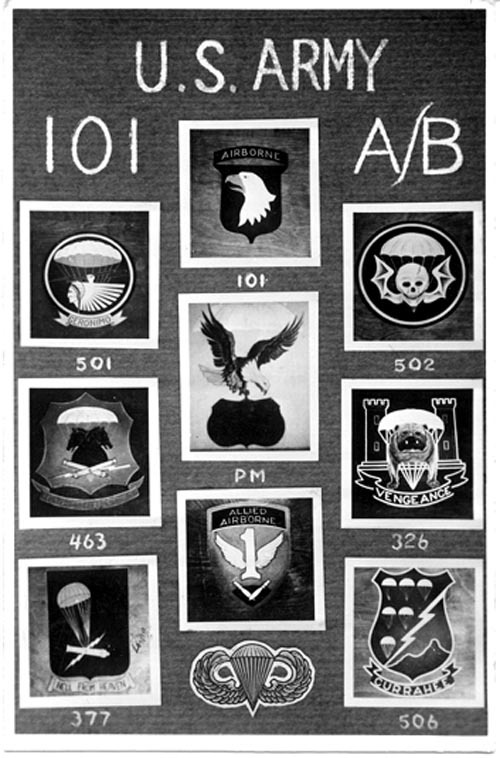 Regimental and Battalion sub unit insignia: The above illustration depicts a collection of insignia painted on A-6 parachute drop container ends (plywood), which were rendered by an artist of the 501 Parachute Maintenance Section named Kunkel, in 1945. Be aware that the above group is incomplete,also that some units had two variations of insignia in use, simultaneously. For example, the 501 Regiment came into existence in November 1942, after the 501st Para Bn had been de activated. When Colonel Johnson requested his new design be approved (Apache war chief holding lightning bolt below a chute canopy), the Heraldry office denied his request. 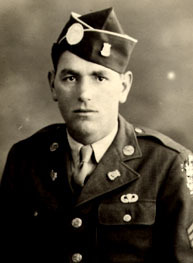 They could not authorize more than one insignia for a unit with the same number and purpose (501st Parachute Infantry). Another design had already been approved for the 501 Battalion. However, despite this denial, Col. Johnson's troops wore their Apache war chief insignia throughout WW2 and ignored the official Thunderbird design, which had been created by LTC William Yarborough. When the 501st was re activated in 1956, the new 101st division adopted the approved Thunderbird design, which had no actual battle heritage, but was officially sanctioned. 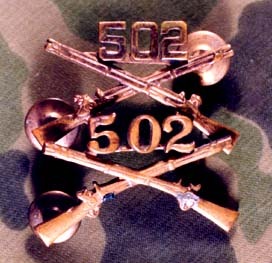 The 501st crest shown is Col. Johnson's preferred design and was made of plastic by the Gemsco company because of the wartime metal shortage-these were worn on lapels and caps by EMs, and on the epaulettes by officers. Because Col. J used to Shout:"Who's the BEST?" and the troops screamed "WE are!" in reply, these plastic pins became known as "We are pins", within the 501. 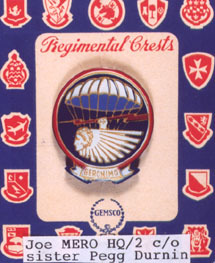 Above, a WW2 era plastic "WE Are" crest, on the Gemsco manufacturer's card. Compliments of Pegg Mero Durnin, whose brother Joe was fatally wounded at Veghel, Holland in late September of 1944. This design depicting an Apache indian chief wearing a war bonnet and clutching a lightning bolt in his fist was designed by Col. H.R. 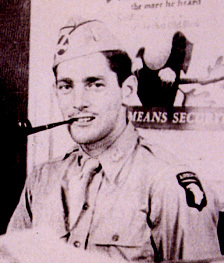 Johnson and a team of artists in the newly-activated 501 PIR in late 1942, to replace the earlier 501st Parachute Inf design of a Thunderbird, which had been used by the 501st Battalion (now defunct) and which had been designed by Colonel Yarborough. 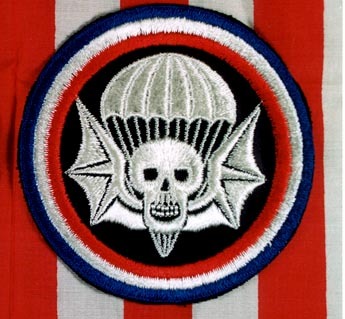 Johnson's new version, with the design shown above, was worn as a pocket patch nearly 6" in diameter, on the jacket, Field, M1941, and the M42 jump jacket. 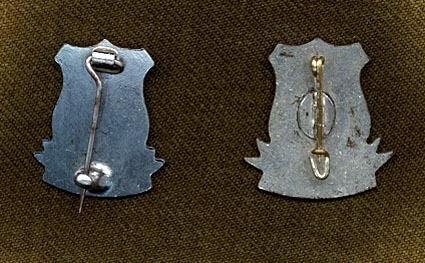 These insignia were worn in the states at formations or when walking out, but not overseas until after VE Day. This was the exclusive insignia used by Johnson's outfit in WW2 and although not approved, this is the 501st insignia with battle heritage. 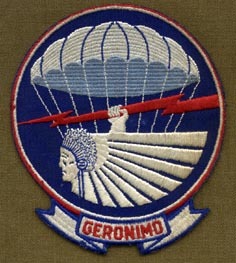 Johnson's Geronimo insignia was designed by Sgts Richard Clarke, Lee Clayman and Eugene Amburgey. Johnson's 501 PIR was inactivated in July, 1945 and not reactivated until the 101st Airborne Division was brought back into existence in 1956. After the 501 was re-activated in 1956, a much smaller (in diameter) variation of Johnson's design was made, with the word "APACHES" embroidered across the front of the patch. These are strictly from the post war 1950's-60s Ft Campbell era and the WW2 501st patches NEVER had the wording 'Apaches' on them! I continually see the small 501st patches with the word 'Apaches' on them being offered as WW2 vintage patches by dealers at militaria shows and on the Internet. It is also worth mentioning that in recent years, some fairly decent copies of Johnson's patch (no wording other than GERONIMO at the bottom and correct diameter) have also been manufactured. 501st Wing Backgrounds (ovals) WW2 paratroopers wore a cloth oval behind their parachutist qualification wings. Each regiment within the WW2 Airborne was represented by a different color combination. In the 501 PIR, it was a red oval with a medium to light blue border. Eventually, many dozens of different unit variations were manufactured, and the practice continues to this day. Because of the proliferation of wing backgrounds, much concern has arisen among collectors as to time period, authenticity, etc. Even during WW2, a number of manufacturers' variations were produced for ovals of the same unit, (more in some units than others), according to demand. The four background ovals depicted above, were all obtained directly from WW2 vets of the 501 PIR. The example at top left is the type that was Issued to the troops, and is a thin, cotton-twill material, surrounded by a very narrow blue thread border. These issued types fade drastically with machine washing and take on a salmon pink appearance, with the border fading to a very pale blue. The example at lower left is the only one of it's type I've seen. At first glance, it looks very much like the specimen at upper right, but it is narrower and made of a textured twill center, surrounded by a blue thread border. This example came from the effects of William Hippler, an Item Co. 501 trooper. 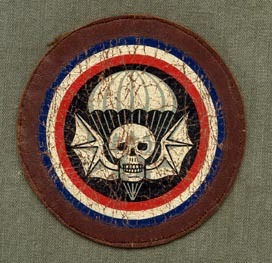 The 502 PIR utilized an unapproved bat wings and skull pocket patch throughout WW2. This was designed by Major Hal McGowan in 1941, when the 502 was still a battalion. The example illustrated is fully-embroidered-the reverse bears a gauzelike cross hatching of white threads. 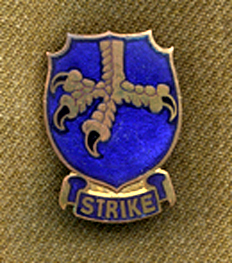 In 1943, a more formal design depicting an eagle claw and the word STRIKE was designed by Sgt Russell May-although not worn during WW2, this design won approval from the Heraldry office and was also adopted by the new division in 1956, over the WW2 design with actual battle heritage. In 1945, a lapel crest was manufactured in occupied Germany, depicting the Strike emblem, but was made in miniscule numbers. Above is a well-worn example of the leather chest patch made for wear on the A-2 flight jacket. I've also seen this worn on the M41 jump jacket. This is actually a decal, applied to a piece of thin brown leather, the circumference of which is greater than the design itself. I suspect these were supposed to present the appearance of being 'painted-on', and indeed they do look like paint after cracking and discoloring with age and wear. This specimen comes from the late Bert Ellard of F/502. Twill variant 502 PIR Patch Update, April, 2007. I recently realized I have been remiss in never posting the fact that the 502 PIR pocket patch also existed in a twill variant. 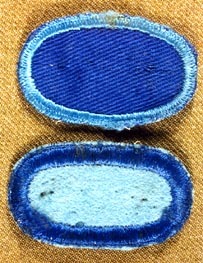 Above are two examples of the twill 502 pocket patch. When in as -issued, new condition (left), the patch at first glance looks identical to the fully-embrodered version. However, close scrutiny reveals that the black background material is twill. Actually the entire bat wings, skull and red, white and blue concentric outer rings, were embroidered in cotton thread, onto a thin twill base. After a number of washings, the black twill background fades rapidly and becomes a dull grey color as shown at right. Looking at the reverse of the mint and well-worn examples is interesting, because the design appears almost as well executed on the reverse as on the obverse. Also, the faded example actually now looks more presentable on the reverse than on the front side, because the background color is now darker on the reverse than on the obverse. I should add the the overall thickness of the fully-embroidered version is thicker than the twill version and the twill type obviously also lacks the gauze layer across the reverse side. By popular request from my friends at ASMIC, here are the 2 known variants of the WW2 502 PIR wing background. You'll note the the light and dark blue tones are reversed on the borders and centers from one design to the other. I do not know the reason for this. 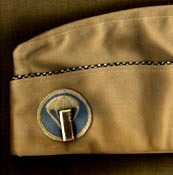 The top type is very thin twill, with a lighter blue cotton thread border. The lower type has a wool center in light blue, with a darker blue cotton thread border. As mentioned previously, a very small number of regimental lapel or epaulette crests were made for the 502 during the 2d half of 1945. Presumably, these were made in Austria or Germany. An example is pictured above, and I have only seen TWO in 30 years of collecting. I've never gotten one from a vet, nor seen one in the effects of a vet. The 'Strike' design was officially adopted by the Heraldry office, and in 1956, when the divison was re-activated, it became universally worn by new members of the Deuce, in a more rectangular, shield-shaped version. 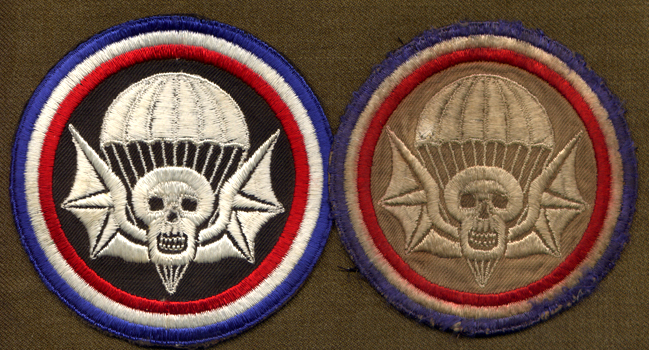 The original design dates to 1943, created by M/Sgt Russell May of H&H S-2 and S-3, 502 PIR. The earliest I've seen the design is hand-drawn on the cover of a pamphlet containing information on the layout of regimental billets in England before D-Day. This dates the pamphlet to late 1943 or early 1944. The design saw NO wear during WW2, and very little in the immediate postwar occupation period. The bat wings and skull 'Widowmaker' design had all the WW2 heritage. As usual, the Heraldry office approved the design with lesser actual combat-era heritage. Earl Kelly of I Co. recently told me that he and his buddies wanted to wear the widowmaker patch on their chests when jumping into Normandy. The officers disallowed that-NOT for security reasons, but because of the similarity of the design to what the German SS were wearing! Officers' Insignia, Unit Numbered Intended for wear at both lapels of the green 4 pocket officer's blouse, or on the left shirt collar, while wearing the Class 'A' uniform, unit-numbered insignia were optional wear for officers while in the U.S. The crossed muskets in the examples depicted above, represent the Infantry, and there are two known types used by the 502 PIR. The top specimen features block style numbers, of uniform thickness throughout. The lower scroll type example, features numbers having a flourish, and differing degress of thickness on the various sections of each number. Both of these styles have also been encountered in the effects of 501st officers. I've only seen the scroll type design amongst WW2 506th officers, but it is probable that they also used examples with the'506' in block numbers. All the WW2 era specimens of numbered crossed muskets I've seen have had clutchback fasteners on the reverse. Bear in mind that unit numbered insignia continued to be manufactured for decades after WW2, and the postwar examples I've observed, have been of the block number style. I have a crossed cannons insignia with the number '907' mounted on it, for officers of that Glider Artillery battalion, but that one was privately modified, and the numbers were not affixed by the original manufacturer. The 502's S-2 Patch Captain Cecil L. Simmons designed this sleeve patch during his brief tenure as company commander of Regimental HQ Company, 502PIR, in summer 1944. It is believed that 30 or less were made by a British patch manufacturer, based on a hand-drawn design, submitted by Captain Simmons. 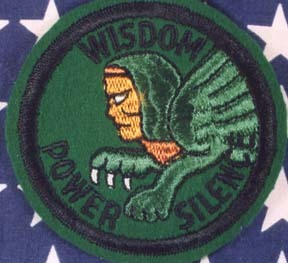 He incorporated a sphinx (the symbol of military intelligence) with the words 'Wisdom Power Silence'. The patch was intended for wear on the lower left sleeve, above any hash marks or overseas bars, much as a pathfinder wing is worn. Simmons offered these patches to his S-2 personnel, at a cost of .30 cents each. He tried in mid 1945, to get the design approved for wear by S-2 personnel in all 4 infantry regiments of the 101st Airborne, but the division was inactivated before that was accomplished. Simmons' S-2 patch is now one of the rarest of all 101st ABD related WW2 patches. on the reverse. Also unlike the known Brit versions, these examples have tarnished, suggesting that they are made of a distinctly different type of metal than the stainless steel, non- tarnishing Brit types previously known. Note also, the pin hinge at the top reverse-distinctly different than the previously known Brit made types. Is it possible that this Sterling type may be U.S. made, and that the stainless Brit versions are copies of the earliest originals? Anyone with knowledge or input about these, please post the info on the forum. I've seen 20-30 of the stainless Brit variants, but these Sterling ones must be rare, with this the only pair I've encountered in 35 years. Photos showing the 506th distinctives in wear before the end of WW2 are rare. This London studio portrait is dated 19 April, 1944, and shows the British made 506th DIs in wear before D-day. 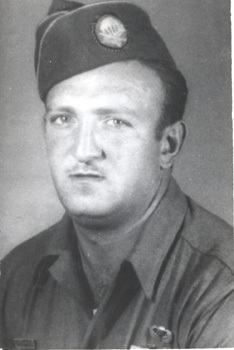 The soldier is Sgt Walter Skeen a.k.a. 'Polecat Scragg'. A censor mutilated the eagle patch. photo courtesy C.A. Mitchell. Although designs are shown on Kunkel's chart for the 326th Engineers, the 377th PFA Bn, and the 463rd PFA Bn, the following should be noted. The 463rd is much better known for its unapproved Bugs Bunny pocket patch. The 326th had no lapel crest nor pocket patch in WW2. The 377th did have a silver on Red crest with the same design shown, but did not have a pocket patch. LTC Benjamin Weisberg the 377th Bn commander was designer of that unit's crest. The parachute riggers who devised the reference photo deliberately ommitted all non jumping units of the 101st Division. The 907th and 321st Artillery Battalions each had lapel crests but no pocket patches. The 327th GIR had an 'Honor & Country' lapel crest only. The 81st AAA/AT Bn had neither a lapel crest nor pocket patch that I'm aware of. Overseas Cap Insignia Above is a sampling of common WW2 Airborne cap patches. 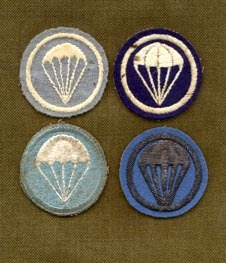 Top left to right, light and dark blue variants of the early parachute infantry cap patch, and an early parachute artillery patch. 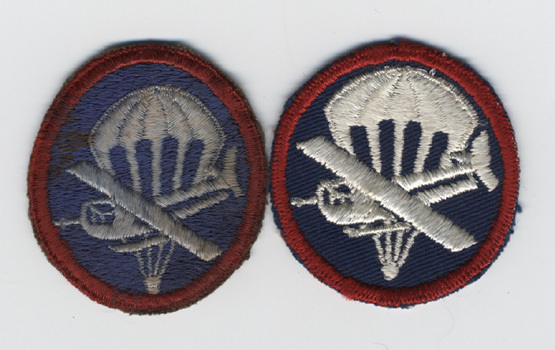 Below left to right, an early glider artillery patch, a theatre-made officers' paraglide patch, introduced in the 101st circa August 1944), and a US made paraglide EM patch.The officer's version had to be worn on the right side of the cap, to allow insignia of rank to be worn in the usual spot on the left side. 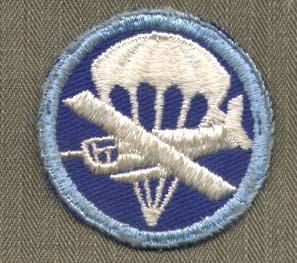 Thus, the glider flies in the opposite direction from that on the enlisted version, as their patch was worn on the left side. In this manner, the glider always appears to fly toward the front of the wearer. 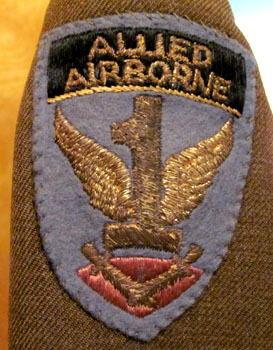 Above: a vintage example of an officer's suntan overseas cap with 2d Lt rank bar pinned onto the blue and white (early) Parachute Infantry cap patch. Note the gold and black officer's piping. This cap belonged to Lt Charles Matson, also of H/502. Illustrated above, a few of the many variants of Parachute Infantry overseas cap patches, worn 1941-44. So many companies made these for the government that it is difficult to find any two exactly alike. The two most common U.S. made types were: 1) cotton thread parachute, embroidered on thin twill base. 2) Cotton parachute embroidered on blue wool base. The patches shown above are of the somewhat less-common variety. 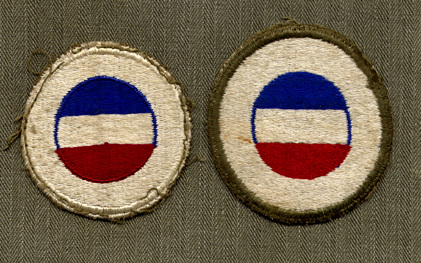 The two top patches belonged to Captain Bob Speer of 2/502. Prior to the 502, Speer belonged to the 551st PIB. I suspect the patch at top left dates to that period and was made in Panama in 1942. The wool patch at top right was made in England in 1944. The two lower patches belonged to Ray Blasingame of F/502. The one at bottom left is a U.S. made, fully-embroidered cotton patch. The one at lower right was made from metallic wire thread in London. This blue and white patch is inclusive for all Airborne Infantry toopers, whether parachute or glider borne. It was introduced in mid-late 1944, as a transition from the plain parachute on blue background, to a more universal Airborne Infantry concept. This style didn't last long, as it was supplanted by the even more universal type, with red added, to include Airborne artillery personnel. Damian Lewis was seen wearing a variant of the above in a late 1944 Paris scene in 'Band of Brothers, although his example was even more obscure, with the glider flying in the opposite direction, for wear on an officer's overseas cap. The few examples I've owned have been cotton thread design, embroidered on a thin, dark blue twill background, like the example shown above. This specimen comes from Sgt.Robert Kandt, who served in the 2d PTR (Parachute Training Regiment), on the Alabama side of Ft. Benning 1944-46. So these patches were around, although I've yet to see one in the hands of a 501st or 502nd veteran. I have several 506th overseas caps bearing these blue and white paraglide patches. This doesn't verify that the 501 and 502 did not receive any through their supply channels, but it might mean something. At least we know that the 506th DID have them. 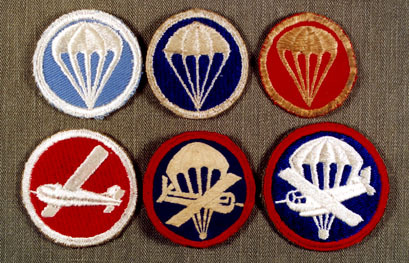 Early Cap Patches for Gliderborne Troops Before the Paraglide patch, combining parachute and glider, was forced upon everyone in August, 1944, Glider-Borne troops had their own distinctive overseas cap insignia. As shown above, these depicted a glider in flight, against different colored backgrounds. The Infantry type was white on Blue, Artillerymen wore a red background, and the dull copper brown background was for Airborne Medical personnel. The color of the last type is about the same shade as dried blood when it is soaked into fabric. Here is photographic evidence that these early glider cap patches were worn on the right side of the cap by EMs, before the introduction of the Paraglide patch. This caused the glider to appear to fly to the rear of the wearer. 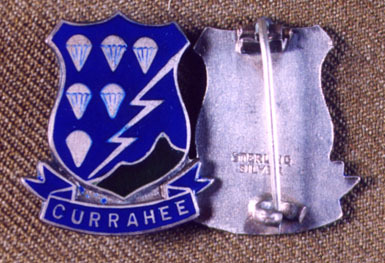 The example above left, shows a Pfc of the 327th GIR, wearing the blue Glider Infantry patch, flying backwards. The example above right shows a 321st GFAB trooper wearing the red artillery version in the same manner. Both photos were made in England, before D-day. pics courtesy K.Barickman and G. Dettore collections. 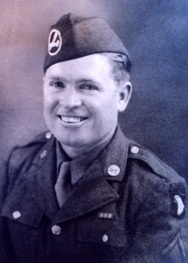 This image was also made in England before D-day and shows a Glider Officer of the 326th AEB wearing his cap patch, with the glider flying to the rear. On an officer's cap, this was the only way to avoid wearing the patch on the left side, with rank pinned onto the patch. This patch also has a white glider on a red background, because the Engineers wore the same colored cap patch as the artillerymen. This officer is unidentified, but his suntan shirt bears a nice Type 8 eagle patch. 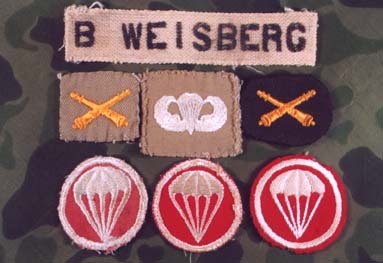 c/o J.Crilley This photo shows a grouping of Parachute Field Artillery officers' insignia, from the effects of LTC Ben Weisberg, the original C.O. of the 377th PFAB. ARTISTIC SEWING The paraglide patches sewn to the 2 caps illustrated above, demonstrate how creative sewing could really enhance the overall appearance of a mundane overseas cap. 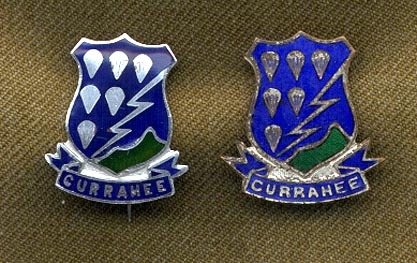 The left example is blue piped, for Infantry c/o Lou Truax (D/506th) and the orange piped example is for Signal troops. The stitching style seems to be the same on both examples. The right example was worn by Merlin Shennum of F/506th, after he transfered to the 17th Airborne, for shipment to the Zone of Interior in 1945. Many eagle shoulder patches were applied with fancy stitching, usually done in white thread. This Blue (for Infantry) 'X' border, on a Type 7, is the prettiest version I've seen. It is applied to the shoulder of S/Sgt Bill Meeker's B/327th GIR Class 'A' blouse. Having a buddy who had been a tailor in civilian life, made this possible. Bill's cutdown M43 (see Uniforms pages) has a Type 5 patch applied by the same guy, in the same manner. 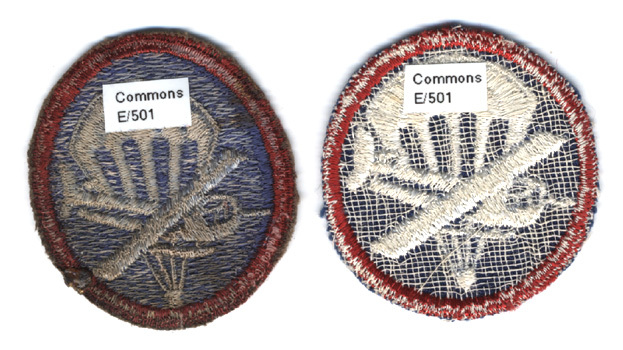 Early Theatre-Made Paraglide Cap Patches Both the above examples came from the effects of E/501 trooper William Commons. 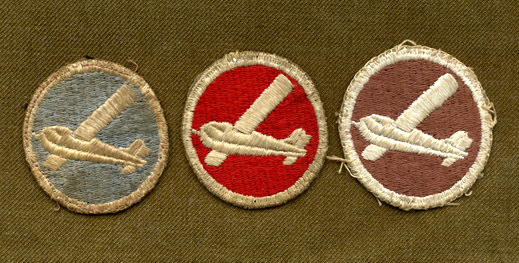 I suspect that many of the early para glider cap patches acquired by 101st troopers were Theatre-Made, like these. 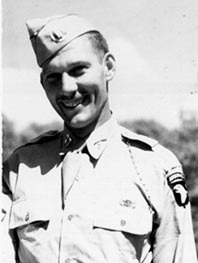 Ed Turer of 3rd plt F/501 wearing a rare Theatre-Made para glider variant, with a black outer border. The 1st Allied Airborne Army This Army was a joint collection of British and American Airborne Divisions, and was formed in the late summer of 1944. A shop in London immediately began producing metallic wire versions, as shown above, but few were produced. This is because a V bomb hit the tailor shop that was making them, in the fall of 1944, while 101st troopers were in Holland. Evidently only a few men managed to get one, before going to Holland. As a result, I've seen only 2 of the Brit-made metallic wire versions. This one belonged to Lt. Charles Matson, of H/502. (The other was on the jacket of a 2/502 man). Other versions exist,(see below). A lot more German-made versions in metallic wire also exist, and those are much more common than the Brit-made bullion example shown above. This unit is sometimes referred to as the "First Triple A". In 1945, many 101st troopers affixed one of these 1stAAA patches to the right shoulder of their Ike jacket, so when it is encountered in wear on 101st uniforms, it is found at the right shoulder of a blouse or Ike jacket. 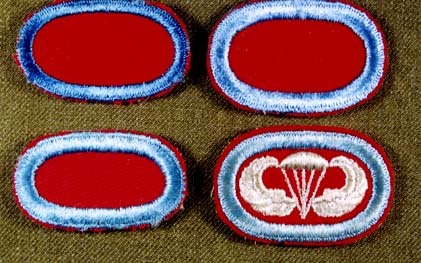 Above are the 3 most commonly seen variants of the 1st AAA patch. At left, the standard British made type, having the wording and design embrodered in cotton thread on a blue felt or flannel wool shield. Next is the most common US made type, fully-embroidered, and featuring a medium blue shield. At right is another US made type, less frequently seen, having a very pale blue-almost grey color to the shield. These are also fully embroidered of cotton thread, in the standard, cut-edge style. Here is a rarely-seen variant-it began as a typical British-made cotton on wool type, but was done-over with metallic wire thread, by a shop in Picadilly. This is on the Ike jacket of Val Colussi, a post Normandy replacement in H Co. 502 PIR. German-made variants exist with only the word 'AIRBORNE' at the top. These date to the immediate postwar period, when the Brits dropped out of the 1st AAA and the remaining Americans existed as an administrative unit, during the occupation in 1945. These German-made patches exist in bullion, Bevo weave, and possibly other styles of manufacture.